I finally have some progress to report on my Ottobre SWAP. 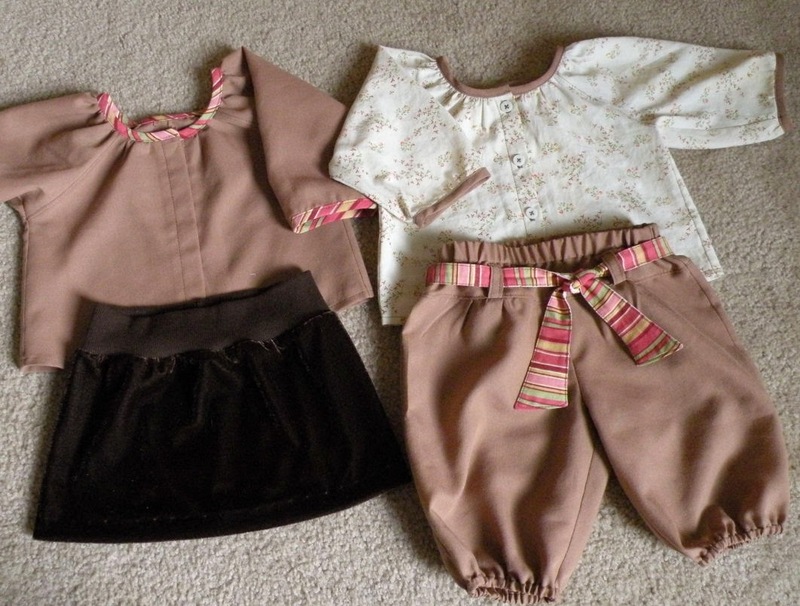 There are actually six garments finished, but I only have pictures of four of them so far. 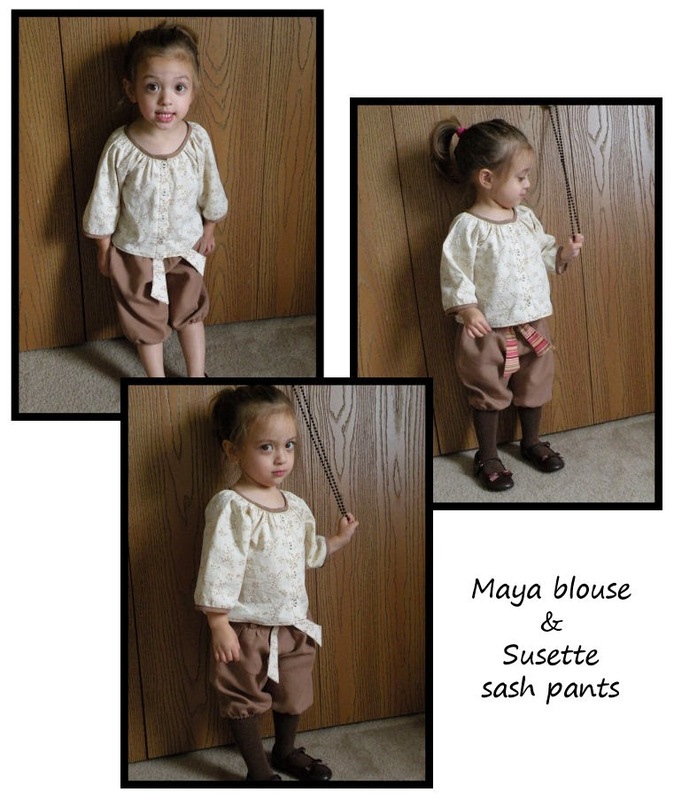 You can see that the brown Maya blouse is lacking buttons. I didn't have anything suitable in my stash, so I'll "have" to go find some at JoAnn's. I'm thinking something to match the medium pink in the trim, but we'll see. I almost never buy buttons...I usually always make do with what I have on hand. The cream Maya blouse is made of a vintage pillowcase I picked up at Goodwill a while back ($0.50). It carries that oh-so-fresh smell that I love on my pillows and is super soft. I have a bit left that I'm going to hoard until just the right project comes up. I'm delighted with how dressy the little skirt came out! It's made of chocolate brown stretch velvet. Miss M thought it was great fun to pet it like a kitten. When I'm done, there will be more mix-and-match options. (Of course! That's kind of the point of planning a wardrobe!) I'm very pleased with how these turned out...but I'm thinking I may add a pinafore dress or two to layer over the blouse and sash pants for warmth. I'm also planning to add more undershirts and tights to her wardrobe before truly cold weather hits. The tights I'll probably buy, but I may make the undershirts. It's bedtime now, but tomorrow I hope to share the other two finished garments and talk about the no-spend week hubby and I are planning as inspired by Eilleen at Consumption Rebellion. Very cute. The tan shirt without buttons would be cute with underlying snaps that you can't see from the front too. I love what you have done so far! It looks adorable. Wonderful work! I did not think of doing that skirt in stretch velvet for colder weather! I was thinking of it as a summer pattern. Very cute! Love the vintage pillowcase fabric top and the little knickers are adorable. Wow, you did an awesome job so far!!! Cute and double cute. It makes me wish I'd got myself organised to join in the Ottobre SWAP. That's a clever idea...I haven't done snaps yet...are they hard? I'm thinking about using the same stretch velvet (there's plenty left!) to make a winter dress. Maybe using the same Muru tunic pattern, but lengthened...but I'm going to hold out for the Winter issue of Ottobre to see if anything else grabs me. (I currently don't own any winter issues). Me too! In fact, I totally splurged on these shoes for her. (To me spending $20 on toddler shoes is a lot!) They'll be her main shoes this fall. Your wardrobe is looking fabulous. I love that it's not over-the-top pink - which is would be if my daughter was designing one. It's classy. I love it.